We start by making a tomato base to cook the rice in. Throw some of the onion, tomatoes, chili peppers, garlic, salt, and water into a blender and blitz to combine. The next step is to cook the rice. In a frying pan, fry a bit of onion in oil and then add the rice. Fry for approx. 2 min. Add the tomato base, bring to a boil and simmer until the rice is cooked. Next, we will make the tortillas. Mix the masa harina, water, and salt in a bowl until you get an elastic consistency. Then roll the dough into smaller balls. Grab two flat surfaces (such as cutting boards) to flatten the tortillas, or use a rolling pin. Stack your tortillas with plastic wrap in between so they don’t stick together. Heat the tortillas in a nonstick pan on both sides. Store them in a clean kitchen towel to keep fresh while you prepare the vegetables and beans. Next, we will make the beans. Cut the onion. Drain and rinse the beans, heat some oil in a pan, fry the onion, then add the beans and mash them in the pan, or leave them whole because they will still taste great. Finally, we will make the veggies. We just like to sauté whatever vegetables we have in the fridge and in this case we will use carrot, onion, chili peppers, bell pepper, zucchini, mushrooms, and garlic. Chop all vegetables. Add oil to your pan, then add garlic, chili, and all the vegetables that take longer to cook first, like onions and carrots. Sauté for a few minutes, then add the rest and fry until soft. Season to taste with paprika powder, chili powder, garlic powder, salt, and pepper. Now that everything is ready, we will assemble the tacos. 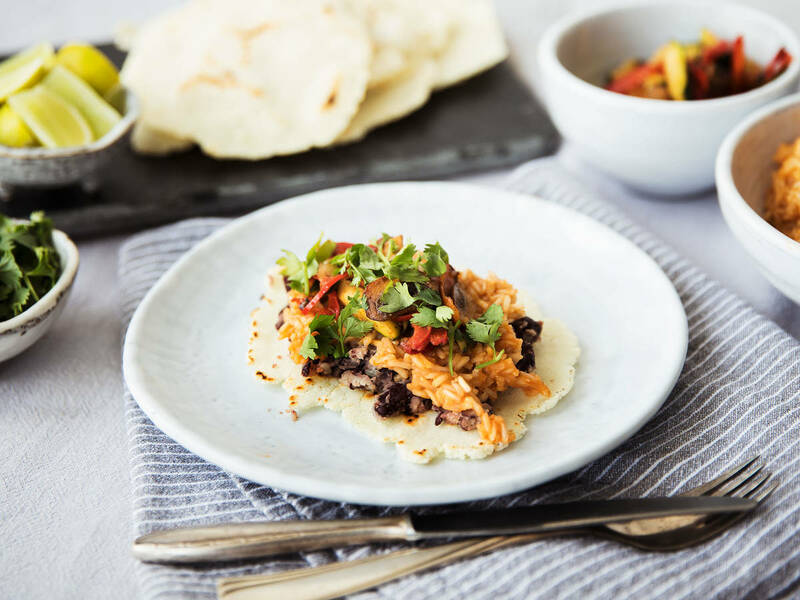 Take tortilla and add beans, rice, veggies, and top it off with cilantro and lime. Enjoy!